This house is not a child's plaything. It is a replica of a real house that existed in Kilburn, North London, which was later destroyed. 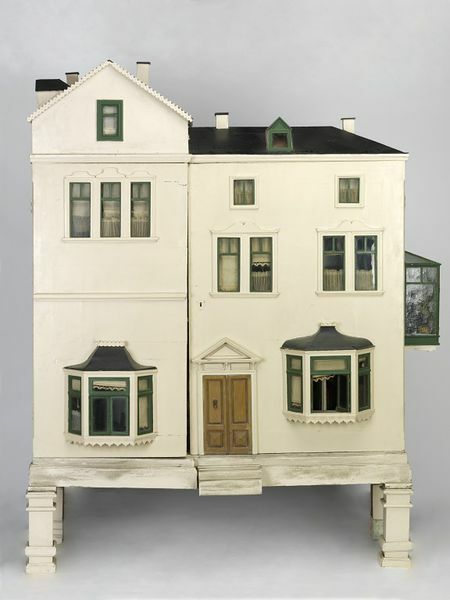 It was made in 1900 for Mr Samuel Loebl, who lived in the house at the time, as a present for his daughter, Cecy. Both his daughter and his grand-daughter played with the house. His grandaughter donated the house to the museum in 1972. It is decorated and furnished in the very latest style for the time and many of the features, such as the fitted bathroom and the double sink in the kitchen, were very modern. The bathroom walls have "sanitary" wallpaper, specially coated to be washable and still a very new idea at the time. Cecy made the carpets, lampshades and upholstery in the bedroom and drawing room. The nursery would still have been the domain of the children and their nurse. It is well stocked with toys and the frieze and pictures provide visual stimulation. There is also the latest in technology - a telephone. 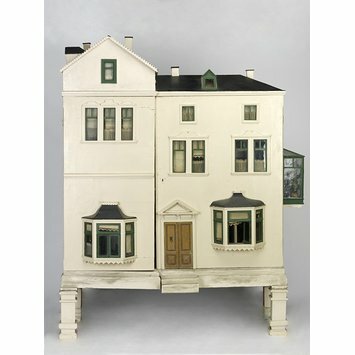 The house was exhibited at a Toy Fair in Frankfurt in 1925. The front is a replica of the donor's mother's house, No 3 Devonshire Villas, High Road, Kilburn in North West London (the house it was modelled on no longer exists). The house contains six rooms plus a conservatory and a hallway. The conservatory is separated from the drawing room by a beadwork curtain. The hallway has a large stained glass panel. The furnishings are very much in the Art Nouveau style of the time. The kitchen and nursery are both particularly well-appointed rooms.